HAPPY BIRTHDAY to my KARALYNN!!!!! Eleven years ago I was SO excited that my first baby had finally made her arrival… a week LATE! I was 19… and had absolutely no clue what I was doing, but was determined to conquer this crazy wonderful thing called motherhood. 3 1/2 years old – look at that blonde hair! 11 years, 3 more babies and 1 angel baby later… I’m realizing motherhood is not something to be conquered, but to be enjoyed most times, to be endured sometimes, to mess up continually, to improve upon as much as possible, and to be celebrated always. I LOVE being my girls’ mother! I really can’t believe I’m the mother of an “almost” teenager. This is the first year Karalynn has been too big to really get her “toys.” Wow. I FEEL OLD! The years have gone by so fast, yet at the same time, it feels like ages ago since I held that tiny little bundle in my arms, walking into Scott and I’s tiny apartment with her for the first time. I’m embarrassed to say that while I’m almost done with Karalynn’s… I’ve barely started on the other girls. I’m afraid I’ll remember very little! NOT GOOD! Still, it’s a goal I have. Anyone else horribly behind on their child’s baby book (for me, I’m doing scrap books for their baby books…)? ALSO! A belated thank you to Melinda and Rachel who sent me the most MARVELOUS gift for Annabelle… a creative memory baby book and scrapbooking supplies!!! I got them around her birthday… and around the time Annabelle took her spell, and I am SO SO SO excited to get to use them! MUST FIND TIME! 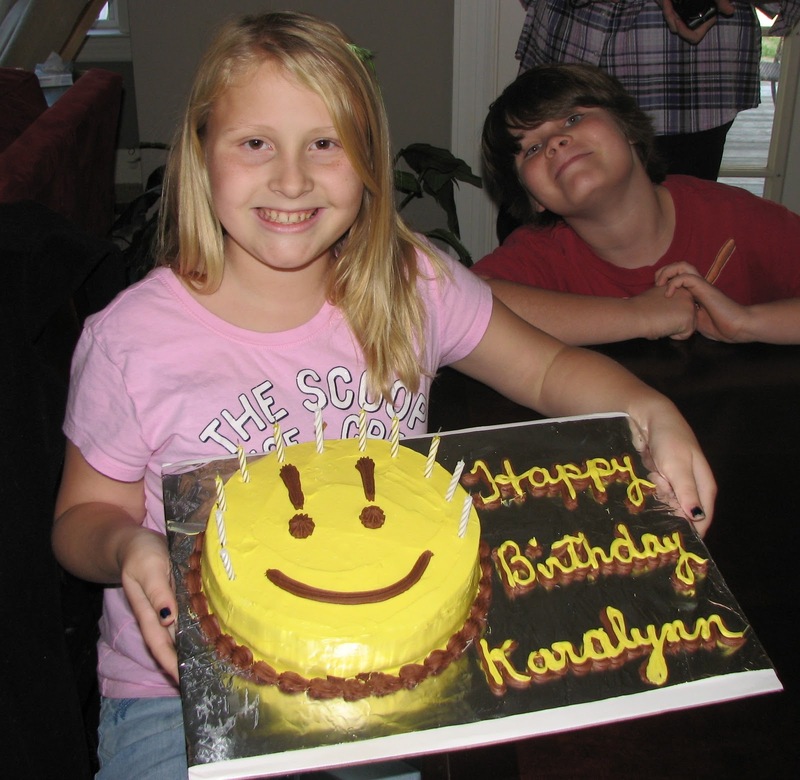 Happy Birthday Karalynn! Beautiful pictures! My child was 4 when I received a TBI and was diagnosed with PTSD and amnesia sooooo remembering anything was a challenge but I did finish her baby book based upon scribbled notes and journals, just a few months ago, 12 years delayed 🙂 So, I think you'll remember once you start going through pics and notes you've jotted down. Don't know what to tell ya about the following 3, good luck! ooohhhh yes…and 2 of my children are married now! They are all in their 20's ('cept my Angel!!). Maybe, soon, I can get started on and finish them! LOL Erica… I think that is a Google ad… I get lots of "medical" ones from my posts about Annabelle, I guess I sound very medicalish! But feel free to click on it.. it gives me money if you do, HA HA HA! Lovely pictures! Happy birthday to your precious girl! Congratulations on your daughter's birthday. I love your take on motherhood. Thanks for keeping it real. Happy Birthday to Karalynn! Love your birthday cake!